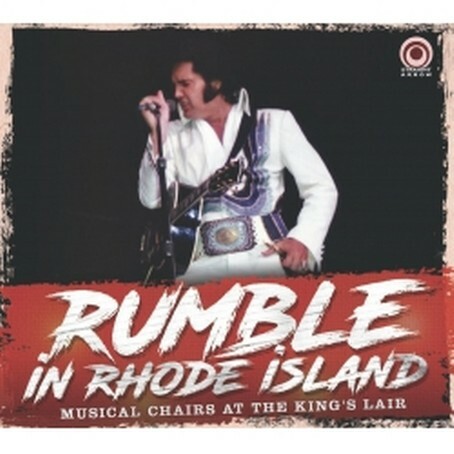 Our first release is titled “Rumble In Rhode Island: Musical Chairs at The King’s Lair”. This is Straight Arrow’s very first release from Elvis' June/July 1974 tour and the Providence concert is easily one of the best of the tour! The Straight Arrow team is always looking for rare, unknown or seemingly lost recordings. Once again, the labels researchers were successful - the Providence, June 22nd, 1974 3pm is a completely new show, even for die-hard Elvis fans. It has never been in circulation - in any form! (note: there is CDR with a so-called Providence, June 22, 1974 Afternoon show in circulation, but this one is wrongly dated recording, in fact this is the evening show). Our CD is taken directly from an original audience recorded mastertape source. It was recorded by the same guy who taped those other Providence concerts on June 26, 1976 (afternoon) and the May 23rd, 1977 shows, which we released in 2011 („Matinee Majesty“ and „Funny How Time Slips Away“, both hard to find CDs now). The sound quality is very good for an off-line recording in a big auditorium. Highlights include a pounding 'Big Boss Man', and a truly dynamite 'Trying To Get To You'. 'Help Me' is sung with great warmth and sincerity. This release is presented in a de-luxe 6-panel digipak. Unfortunately, only very few useful Providence June 22, 1974 3pm photos were available, and other shots taken during June/July 1974 tour have been used. 01. Introduction: Also Sprach Zarathustra - 02. C. C. Rider - 03. I Got A Woman / Amen - 04. Love Me - 05. Tryin' To Get To You - 06. All Shook Up - 07. Love Me Tender - 08. Hound Dog - 09. Fever - 10. Polk Salad Annie - 11. Why Me Lord - 12. Suspicious Minds - 13. Introductions of singers, musicians, orchestra - 14. I Can't Stop Loving You - 15. Help Me - 16. An American Trilogy - 17. Let Me Be There (with reprise) - 18. Funny How Time Slips Away - 19. Big Boss Man - 20. (Let Me Be Your) Teddy Bear / Don't Be Cruel - 21. Can't Help Falling In Love - 22. Closing Vamp / Announcements.